- 4 Hour Night out in Chinatown with Dinner# - Chinatown has come a long way since the early days when Chinese immigrants made this enclave their home. Filled with a sprawling myriad of shops and eateries, it bustles with colourful and exciting activities set against a backdrop of rich history and heritage. Chinatown is not to be missed especially in the evening when everything really comes alive. Visit Thye Shan Medical Hall, established in pre-independence Singapore in 1955, and is respected by the industry as one of the Traditional Chinese Medicine (TCM) pioneers in Singapore. After dinner at a local Chinese restaurant, wander along the narrow lanes of the Night Market and test your bargaining skills against street vendors selling anything from souvenirs to leather goods. The highlight of the evening is a trishaw ride that takes you through the alleyways of Chinatown and down to Clarke Quay. There hop onto a bumboat for a cruise along the Singapore River to see Singapore lit up at night, showcasing beautifully restored shop houses, modern skyscrapers of the financial district, colonial buildings and the iconic Merlion statue. - Admission Cable Car Ride# - Soar high above the two destinations through the sky on the most scenic highway in Singapore for priceless views. Fly high above the hill from Faber Peak Singapore, through a skyscraper and cross the harbour on the Mount Faber Line before landing in Sentosa Island. Along the way, look out for the dolphins down below at Resorts World Sentosa's Adventure Cove! Then journey over the jungle, sand and sea on the new Sentosa Line which will take you to dozens of attractions on Sentosa, also known as the State of Fun. Choose your stop at the Merlion station, Imbiah Lookout station and Siloso Point station to enjoy the sandy beaches, Underwater World Singapore, Madame Tussauds, Megazip Adventure Park, Skyline Luge Sentosa, 4-D AdventureLand, Tiger Sky Tower, Universal Studios Singapore and the S.E.A. Aquarium. For those with Lunch - check out SPUDS & APRONS, the fun and playful Food and Beverage joint at the top of the hill of Faber Peak Singapore, serving up yummy east and west dishes. You can opt to chill out at the air-conditioned Dining Room or relax at the Alfresco Garden. 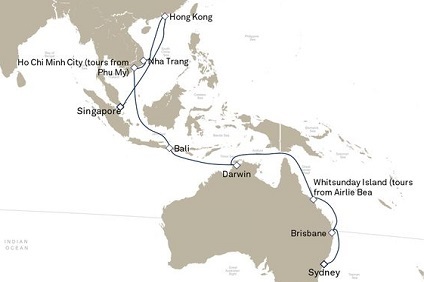 25 Night World Voyage sector sailing from Sydney to Singapore aboard Queen Victoria. Leave Sydney Harbour for the beauty of Brisbane’s Gold Coast and the Whitsunday Islands. From Darwin sail to tranquil Bali then verdant Vietnam, before an exciting finale in Hong Kong and Singapore. The stunning harbour city, Sydney, is Australia’s oldest and largest urban centre. Its fascinating modern history began in the year 1788 with the arrival of the ‘First Fleet’ of 760 British convicts. Gold mining and sheep breeding propelled Sydney’s development, and today it’s the largest port in the entire South Pacific. Mark Twain called it “the wonder of the world”. Situated on the remote northern shores of Australia’s ‘Top End,’ balmy Darwin has matured from its early days as a true frontier settlement to become a welcoming, lively and multicultural modern city. The region’s history is long and full of drama, from its Aboriginal heritage to World War 2 air raids and the devastating Cyclone Tracy. It’s all here in the excellent museums and galleries. Extravagance is the theme among the fabulous millionaire mansions built in Renaissance, Rococo, French and Victorian style atop Newport’s cliffs. Its yacht-filled harbor has hosted the America’s Cup. With a population of 300,000, Nha Trang still retains its small-town atmosphere and is well known for the friendliness of the locals. Take a ride on the cable cars or stroll along fine beaches below. Contradiction is part of Hong Kong’s attraction. While the city buzzes with modern commerce, soaring skyscrapers and sophistication, it remains a place of ancient beliefs and intriguing local customs. Amid the sky-high buildings, discover the small gilded shrines, the endless market stalls of salted eggs, squid, medicines and remedies, and the red-sailed junks and sampans of the harbour. Among the one of the world’s busiest ports and prosperous cities, Singapore is full of culture, history and excitement, where you are welcome to enjoy a tropical climate and multicultural population. At its colonial core is Padang, a cricket field since the 1830s now flanked by the 18 Corinthian columns of City Hall. In Chinatown stands the oddly named but beautiful Buddha Tooth Relic Temple.